the ground is white. the sky is white. there is a giant transparent pyramid on the ground. there is a transparent statue -3 feet below the pyramid. it is -3.45 foot in front of the pyramid. 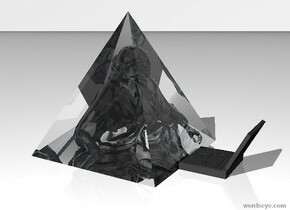 there is a dark grey 1.5 foot wide computer on the ground in front of the pyramid. it is facing the statue.